Crossword Puzzles Help Students Learn New Vocabulary. As students face learning new information, one of the most important aspects is becoming familiar with the vocabulary associated with the subject. Having a strong awareness of the vocabulary has several advantages for the novice in any subject area. First, knowledge of the vocabulary and its meaning allows the student to read with greater fluency, stumbling over fewer words as they gather data. Secondly, the greater their understanding of the vocabulary, the more hooks are present for attaching new concepts. As anyone learns new information, connections are made between that which is already known and the new information to be acquired. When the vocabulary is strong, the new information has something to which it can be associated and learned. Crossword puzzles are best for those students who have reached a certain level of mastery with the vocabulary and its meaning. They can be a true test of the ability to read a definition and come up with the vocabulary word. The clues that come from the cross letters are only minor supports for a student who truly knows the words and their meanings. Through the manipulation of the vocabulary words in a crossword puzzle, students review the concepts associated with the subject matter. 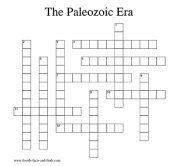 At www.rocksandminerals4u.com you’ll discover crossword puzzles to help you or your students become familiar with the world of rocks, minerals, and geology.